Creating a forest out of nothing! In the beginning: there was the Sludge Paddock! Western Water owns a 692 hectare property at Butlers Rd, Melton South where it operates the Melton Recycled Water Plant (RWP). A large part of the property is currently leased for farming activity using recycled water from the Melton RWP. The majority of the property consists of agricultural pasture but also incorporates wastewater lagoons and infrastructure, agricultural structures and areas of native vegetation such as Pinkerton Forest and the Werribee River. Melton RWP is within the Victorian Volcanic Plains (VVP) bio-region and is found 1 kilometre west of Mt Cottrell. Western Water in association with Pinkerton Landcare and Environment Group (PLEG) has been undertaking biodiversity enhancement works in Pinkerton Forest for 15 years and along the Werribee River valley for the last four years. Pinkerton Forest can be found in the centre of the Melton RWP and consists of approximately 35 ha of remnant plains grassy woodland. Approximately 3.8km of river frontage exists where the Werribee River borders the western boundary of Surbiton Park and cuts a deep volcanic gorge in the landscape. The Werribee River valley contains patches of poor-medium quality remnant native vegetation. Western Water has to date been undertaking revegetation works along approximately 2km of Werribee River frontage in partnership with Melbourne Water and PLEG. Bordering Surbiton Park is a Melton Shire Council owned remnant native vegetation patch known as Bush’s Paddock which lies approximately 370 metres north of Pinkerton Forest. Pinkerton Forest and Bush’s Paddock are separated by an area of land on Melton RWP which has previously been used for the controlled disposal of bio-wastes from the waste water treatment process for over 20 years. This area, known as the ‘sludge paddock’, is no longer used for disposal of bio-wastes. Western Water has recognised that management input is required to ensure the long-term persistence and enhancement of biodiversity values of Melton RWP due to a general awareness of best practice environmental management, planning and compliance with statutory obligations. In recognising the biodiversity values of the property, Western Water would like to further enhance the biodiversity attributes of Melton RWP by creating a habitat corridor between Pinkerton Forest and Bush’s Paddock by revegetation of the sludge paddock with indigenous flora species. The habitat corridor will link the two fragmented remnant vegetation patches and allow native fauna to traverse between the two areas, enhancing the significance and importance of the two sites. Western Water has received joint funding for the project through the Vision for Werribee Plains (V4WP) grants program run by the Department of Sustainability and Environment. Pinkerton Forest is a remnant Plains Woodland approximately 35 hectares in size. The vegetation is mostly comprised of mature Grey Box (Eucalyptus microcarpa) with a moderate quality understorey due to a history of cattle and sheep grazing. In 1992 Pinkerton Forest was fenced off and has since been managed to improve the biodiversity of the forest. Grassy Eucalypt Woodlands of the Victorian Volcanic Plains have recently been listed as critically endangered under the Environmental Protection and Biodiversity Conservation (EPBC) Act 1999. Bush’s Paddock is a Melton Shire Council owned reserve located on the north east boundary of the ‘sludge paddock’ and has had a long history of stock grazing however recent plantings, weed and pest animal control is beginning to restore the site. The vegetation is remnant Plains Woodland but also contains large areas of native grassland. Natural Temperate Grasslands of the Victorian Volcanic Plains are also listed as critically endangered under the EPBC Act 1999. Pinkerton Forest and Bush’s Paddock are vegetation relics of pre-European settlement and provide many habitat opportunities for ingenious fauna species. Within a five kilometre radius of the Melton RWP, a total of 380 hectares of grassy eucalypt woodlands exist in four fragmented patches and is a hotspot for this type of vegetation community. Pinkerton Forest and Bush’s Paddock are examples of fragmented vegetation or habitat islands. Animals in an 'island' situation are vulnerable to catastrophes such as disease, bushfire and gradual changes like inbreeding and variations in climate. Significant fauna species have been recorded in these vegetation communities. The habitat corridor will provide native fauna with a larger habitat area, increased available food supply and promote healthier and larger populations. The link will also create a greater likelihood of sustaining populations which undergo any fluctuations or catastrophes. The sludge paddock has been used for controlled disposal of liquid sludge from waste water treatment process for 20 years. The disposal of sewage sludge over many years has altered the profile of the soil surface in comparison to the surrounding land. The disposal of this material may have also increased the nutrient loading in the soil. However the disposal sludge has ceased more than two years ago and it is expected the nutrient concentration would have reduced. 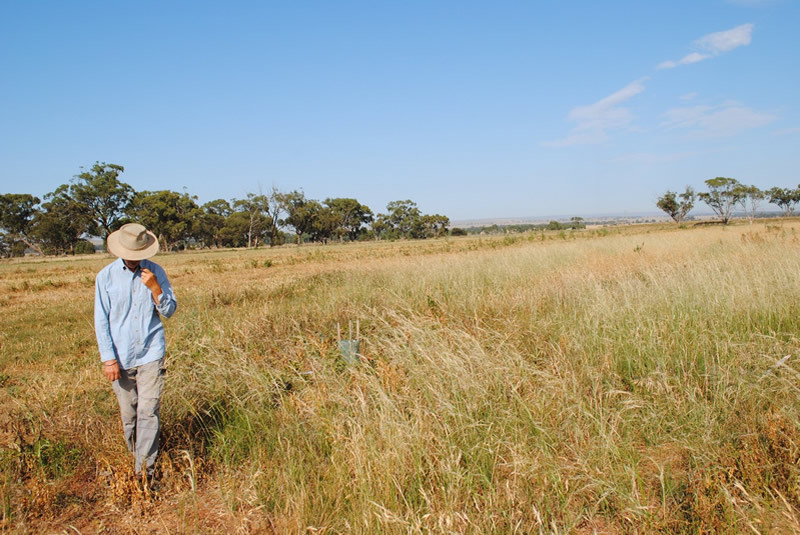 Soil analysis may be required to determine any constraints to the revegetation process. The consultant is not expected to conducted the soil testing, however, should advice Western Water on types of analytes and the extent of soil testing required. The consultant is expected to interpret the data to determine the possible impact on vegetation and recommend any alteration to the site to minimise adverse impact on vegetation. Eight mature remnant Grey Box trees exist scattered throughout the paddock. There is also a mixture of indigenous shrub species along the eastern and northern fence lines comprising Tree Violet (Melicytus dentatus) and Golden Wattle (Acacia pycnantha). The understory across the majority of the paddock is a mixture of introduced annual grasses, herbs and prostrate shrubs. High priority species for control may include but not limited to Galenia (Galenia pubsecens), African Boxthorn (Lycium ferocissimum), and Serrated Tussock (Nassella trichotoma). Lower priority species are present onsite including Toowoomba Canary Grass (Phalaris aquatica), Kikuyu (Pennisetum clandestinum) and Wild Turnip (Brassica sp.). The long term objective of Western Water is to transform the ‘sludge paddock consistent with the existing woodland habitat that exists to the north and south. In order to meet this long term objective, Western Water wishes to develop a detailed Revegetation Management Plan for the sludge paddock. On Saturday 13th August 2011 Western Water & Pinkerton Landcare & Environment Group (PLEG) invited the community to join them planting between Pinkerton Forest & Bush’s Paddock, near Mount Cottrell. This was in fact an invitation to participate in the beginning of an innovative project to grow a Grassy Woodland from scratch! Entry to the site was made through Western Water’s treatment plant at Surbiton Park via Butlers Road at Strathtulloh, to avoid disturbing a pair of endangered Sea-Eagles. On the Friday prior to the community planting day, holes were drilled by contractors & the eucalyptus mulch was spread around the remnant Grey Box trees. Irene Cook in the seeding of spear grasses in Jan 2012. 28 people planted almost 1,000 grasses, herbs and trees. Participants were from groups as varied as Melton Bushwalkers, Girl Guides & Scouts, as well as other interested members of the community. A variety of plants were planted. We also distributed the cleaned Austrostipa scabra (Speargrass) and Austrodanthonia (Wallaby Grass) seed in half of the scraped area in the centre of the paddock. And we are thrilled it has rained which will help to settle the plants in. This ambitious & innovative project by Western Water aims to achieve nothing less than to replant a forest on a paddock that is at present virtually devoid of native vegetation! 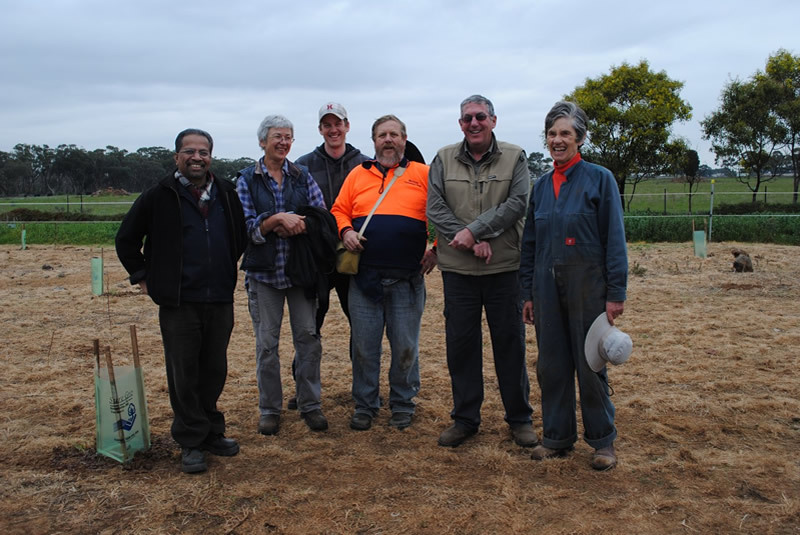 Many of the plants for the Sludge Paddock Restoration Project were grown under the supervision of Judy Allen at the Dame Phyllis Frost Centre. Melton Environment Group & Pinkerton Landcare & Environment Group are both involved in an exciting project whereby the Dame Phyllis Frost Centre are growing seedlings for environmental revegetation from locally collected indigenous seeds supplied by local groups. Earlier this year PLEG & MEG supplied the centre with local indigenous seeds to grow wildflowers for sites in Melton & at Pinkerton Forest. The project is under the direction of indigenous plant expert Judy Allen. Judy is a TAFE teacher at the Dame Phyllis Frost Centre teaching a course in Horticulture. Judy spoke to local environmental groups in May at Melton Shire Council. The Centre has grown a number of plants for local revegetation, which are now ready for planting. Judy attended the planting day to report back on where their seedlings were planted. Many thanks to Judy Allen & the women at the Dame Phyllis Frost Centre for helping us create a forest on this empty paddock. Many thanks to everyone who turned up on this historical occasion to begin the long process of planting a forest here.